Are You a Social Media Goofus, or Gallant? If you grew up in the US, you likely remember two characters from Highlights magazine (often found in doctor office waiting rooms) who helped us learn manners. The cartoons would describe a situation and how the fictitious boy Goofus and Gallant would respond. We’d learn to follow Gallant’s example and not Goofus’. On Twitter, Goofus posts only items that will benefit him, and does not engage with others. On Twitter, Gallant posts useful resources, answers others’ questions, and has frequent conversations with others, often learning in the process. On LinkedIn, Goofus posts frequent, self-serving items to large groups, and becomes irritated when told there are rules for posting. On LinkedIn, Gallant realizes that the groups are meant to serve a purpose, so he restricts the number of posts, and ensures that the content is appropriate for the group and not always self-serving. On LinkedIn, Goofus sends connection invitations to many people he doesn’t know, with no explanation for why they should connect. On LinkedIn, Gallant realizes that people who don’t know him might not want to connect, so he only invites people he knows or writes a polite note to people he doesn’t know, explaining why he’s asking. Goofus talks about politics and controversial subjects, even on his business accounts. Gallant realizes that he may offend others with different views and expresses political views only amongst his friends. On Twitter, Goofus decides to send everyone that follows him an automatic message promoting himself. On Twitter, Gallant knows that people who have just followed likely want some sort of personal interaction with him, or nothing at all, so he sends a personal message when it seems appropriate. Goofus expects that social media should be immediately useful, and feverishly tries to get as many connections and followers as possible, often just broadcasting that people should connect or follow him ‘just because.’ Gallant realizes that building a quality network using social media takes time, and knows that providing value and forming relationships is the way to ultimately benefit the most from the experience. Goofus gets an idea for a blog post from a colleague, but doesn’t give the person credit in the post. Gallant realizes that social media is all about community, and that giving credit to others is not only the right thing to do, but results in a richer community for all of us, as it allows his blog readers to make connections with other bloggers. Goofus sees news, a job listing, or a link that others may find useful, but neglects to pass on the information. Gallant is always thinking of others when he has a new opportunity or makes a connection, and finds that others return the favor. At a corporate level, there have been companies who have been a ‘Goofus’ and paid for it, one caveat to launching a major social media campaign without understanding the genre. On a personal or company-wide level, your reputation in social media is very important (on Twitter we call it ‘Tweet Cred’). When done properly, your Social Media ‘capital’ can surely be used to promote yourself or your company, but you should never view it exclusively for that purpose. When starting out, be careful, and if you have any doubts, ask someone more experienced than you how your actions may be perceived. Also, Comprendia offers social media coaching and strategies for you or your company to help you get off on the right foot, contact us for more information. 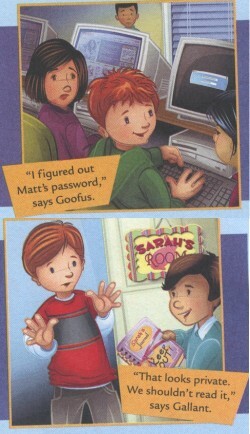 Interestingly, the folks from Highlights For Children magazine saw one of my tweets about Goofus and Gallant and sent me the images for this post–special thanks to them. Talk about serendipity!